PARISH – Altmar-Parish-Williamstown Central School District will host its annual “Stuff-A-Bus” school supply distribution to students on August 26 from 9 a.m. to noon. APW will host its annual “Stuff-A-Bus” August 26 from 9 a.m. until noon, and a bottle and can drive to support efforts will be held August 8 to 12. 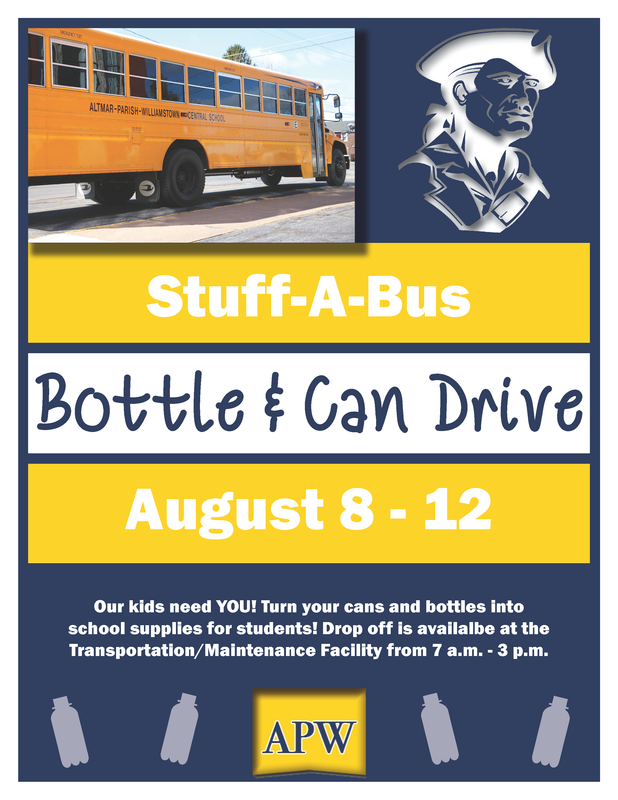 The district will also have a bottle and can drive from August 8 to 12 to raise funds for the purchase of school supplies. “Stuff-A-Bus” aims to provide the necessary school supplies every student needs for academic success. Community members have the opportunity to turn their cans and bottles into school supplies for the students in the district who need them. Drop off for the bottles and cans is available at the APW Transportation/Maintenance facility from 7 a.m. until 3 p.m.
For more information, call 625-5295. This are very good campaigns and are very helpful for school districts and students,parents that are in need. In this case the parents and students i’m sure are in need but didn’t I just read that this school district has 41% over the amount allowed in their bank account. They still raised taxes knowing they had so much in the bank. The only can drive here should be the caning of the school board and the business manager and superintendent . The school supplies should be supplied by the district the taxpayers have already given enough.